Last October, 131 earthquakes hit the Lassen Peak area. Most were less than 2.0 in magnitude. But since then the water table has fallen significantly. Seismic activity may be affecting wells. The seismic activity further fractures the rocky, volcanic soil, allowing the water to flow deeper into the Earth. Officials at the USGS said they are hesitant to draw a correlation between the quakes and the drop in the water level in Cassel (it sits at an elevation of 3,176 feet (968 m)). Lassen Peak, also known as Mount Lassen, is the southernmost active volcano in the Cascade Range. It is part of the Cascade Volcanic Arc which is an arc that stretches from southwestern British Columbia to northern California. Located in the Shasta Cascade region of Northern California, Lassen rises 2,000 feet (600 m) above the surrounding terrain and has a volume of 0.5 cubic miles (2 km3), making it one of the largest lava domes on Earth. It was created on the destroyed northeastern flank of now gone Mount Tehama, a stratovolcano that was at least 1,000 feet (300 m) higher than Lassen Peak. Lassen Peak and Mount St. Helens – which had a massive eruption in 1980 – are the only two volcanoes in the continental United States to erupt during the 20th century. The most recent eruptive period of Lassen Peak began in 1914, and lasted for about seven years (see below). The most powerful of these eruptions was an explosion in 1915 that sent ash and steam in a 6-mile (10 km) tall mushroom cloud, making it the largest recent eruption in the contiguous United States, until the explosion of Mount St. Helensin 1980. 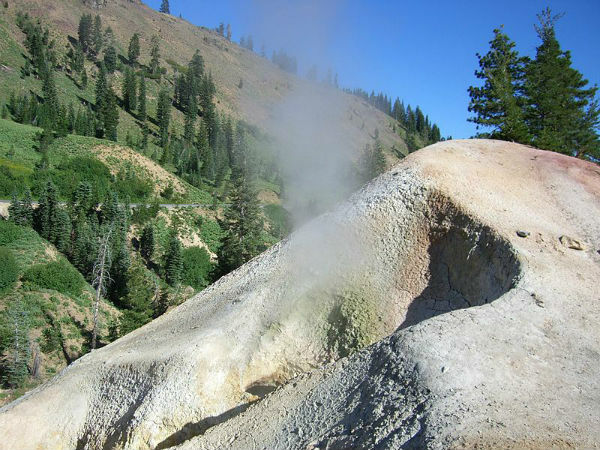 The region around Lassen Peak remains a mildly-volcanic one, with mud pots, active fumaroles, and boiling water features demonstrating their activity. The area around Mount Lassen and the nearby Mount Shasta are considered to be the most likely volcanoes in the Cascade Range to erupt during the coming decades and centuries. The source of heat for volcanism in the Lassen area is subduction off the Northern California coast of the Gorda Plate diving below the North American Plate. Steven Ingebritsen, a research hydrologist with the USGS, said the swarm of quakes that hit the Lassen Peak area last fall were too small to be causing the water table to fall in the Cassel area, some 45 miles away. He points that magnitude 3.0 quake can affect water table levels in an area of about 9,5 km (6 miles); a magnitude 4.0 quake would affect groundwater up to about 29 km (18 miles) away; and a 5.0 magnitude quake would affect wells in a 100 km (62-mile) radius. Rainfall levels also affect the water level. And Cassel, like the rest of the north state, went through a dry winter. Mount Shasta is located at the southern end of the Cascade Range in Siskiyou County, California and at 14,179 feet (4,322 m) is the second highest peak in the Cascades and the fifth highest in California. Mount Shasta has an estimated volume of 85 cubic miles (350 km3) which makes it the most voluminous stratovolcano in the Cascade Volcanic Arc.he mountain consists of four overlapping volcanic cones which have built a complex shape, including the main summit and the prominent satellite cone of 12,330-foot (3,760 m) Shastina, which has a visibly conical form. If Shastina were a separate mountain, it would rank as the fourth-highest peak of the Cascade Range (after Mt. Rainier, Rainier's Liberty Cap, and Mt. Shasta itself). About 200 years ago the last significant Mount Shasta eruption came from this cone and created a pyroclastic flow, a hot lahar (mudflow), and three cold lahars, which streamed 7.5 miles (12.1 km) down Mount Shasta's east flank via Ash Creek. A separate hot lahar went 12 miles (19 km) down Mud Creek. This eruption was observed by the explorer La Pérouse, from his ship off the California coast, in 1786. The seismic activity also may be related to other soil problems in the area, including a sinkhole that developed March 14 in the side of a holding pond Pacific Gas and Electric Co. uses in a Hat Creek Hydroelectric project in the Cassel area. A sinkhole 1 meter (3 feet) wide and 1,5 meter (4 feet) deep developed at Hat 1 Forebay this month, so they drained the pond. PG&E hired a soil scientist to investigate the cause of the sinkhole, but they have reached no conclusions. Hat 1 Forebay will remain closed until May. 858 fish had to be rescued and hauled to nearby Cassel Pond. Sinkholes also have developed at nearby Baum Lake. The Baum Lake sinkholes were caused by underground lava tubes, which are underground tunnels formed by ancient lava flows. Subway Cave, near the intersection of highways 89 and 44 in Hat Creek, is a lava tube big enough to stand up in. The sinkholes develop when the earth berms on the lakeshore erode away and are basically sucked down toward an underground lava tube. He didn't know the size of the lava tubes that damaged Baum Lake. He said sinkholes sometimes are caused by rodents digging in the berms. About 30 miles to the west, Paul Schoen's 60-acre Arthur Lake has been losing water for many years. Hired consultants concluded the volcanic rocks below the surface have cracked and the lake drains from the bottom. In the spring the lake is full, but by the end of the summer all the water is gone. The subsidence was discovered in a parking lot in Lassen Volcanic National Park and there have been some problems found on the road through Lassen National Park. The road is hot and soft in the area around The Sulphur Works, in the southwest part of the park. Please all, I urge you to read the Quran. Let us prepare for the end and our meeting with God almighty. I wouldn't doubt the water isnt being siphoned off by a water bottling company or the government so you wont have a source of fresh water and will have to buy water from them. I grew up in Hat Creek. There are many sinkholes and lava tubes around. Some have absolutely gigantic trout in them (or did, back then), but were only known to a few locals as they were located out in the lava beds behind private property. Nobody really knew now they managed to have a constant flow of water to support such large fish, but they did. The entire area is virtually riddled with volcanic rock, creeks and hidden holes. If Lassen becomes geologically active again, or even if Mt. Shasta does (not that far away), then all bets are off for this entire area. Resident: Truly, I would say, this same condition applies EVERYWHERE in the U.S.- and worldwide, esp. now with fracking. God help us! God will not help us.... we screwed up our world. Remember the adage: God helps those who help themselves? Ya know? Yep, perfectly good world, fresh water for all, fresh air for all, plants, animals, etc..... and what did humans do? So i wouldn't be putting any bets on 'God' swooping down and helping us out.